The rise in popularity of the use of marquees as wedding “venues” has been phenomenal in recent years. After all, they are far less expensive than a hotel venue. If you always dreamed of staging your wedding in the gardens where the proposal took place, a wedding marquee offers a means of doing so. They offer much more flexibility for your wedding. However, one thing that can hold a couple back from going down the marquee route is the worry over weather. Well, never fear, wedding marquees can offer the perfect wedding party venue whatever the weather – really! Toilets and smoking areas can be attached directly to the marquee so that your guests never have to encounter whatever weather lies outside. If rain is threatening, buckets of umbrellas can be provided all around the grounds and at every entrance to the marquee. You can even hire some staff to carry the umbrellas as they lead guests to their intended destination – a luxurious touch for guests! As for inside the marquee itself, you can be ensured that not a drop of rain will enter. No matter which type of marquee you choose, they are all designed to protect vigorously against the elements. Do you plan on staging a wonderful Winter Wedding? Are you worried that your guests may find a wedding marquee a tad cold – even after all the dancing? Don’t worry, heating systems can easily be installed inside the venue to ensure that all guests stay lovely and warm. You can eliminate thoughts of guests being able to see their own breath in the air. Adequate heating systems are available for hire which can assure that guests will be oblivious of the harsh winter weather outside. You can also have proper doors on the marquee to ensure the cold stays locked out where it belongs. Perhaps you are having a beautiful summer wedding – right when temperatures can soar. You may then fear with a wedding marquee venue that your guests could become uncomfortable due to the heat. The dance floor could even become a sweaty haven by song number three! To avoid this issue, firstly ensure that the size of the marquee is more than spacious enough for the number of guests intended. On the day itself, the sides of the marquee may be folded back to allow the cool air to circulate. When it gets cool, the sides can easily be taken back down again. Of course, you can also install some fans within the marquee for the day which will also help with air movement. As you can see, should the weather change at all, only minor precautions or amendments will need to be made. These are not costly amendments and do not require months of planning. The reason why marquees make such an ideal wedding venue is that they are so easy to adjust and adapt to your needs – even for things that you cannot control, like the weather! A wedding marquee, just like any wedding venue, can be decorated, to your needs and desires. Wedding colour schemes, table layouts and flower arrangements can all easily be adhered to. Having said this, there are some key tips to remember when decorating a marquee specifically for a wedding. During the day, your wedding marquee will be illuminated by the natural daylight outside. However, in the evening time, it will most probably become quite dark. When darkness falls, you can opt for strings of fairy lights around the walls of the marquee, similar to the style that can often be seen in an upmarket restaurant. You could also opt to hang the fairy lights from the ceiling, which can create quite a magical and enthralling atmosphere. Fairy lights are an inexpensive yet quaint form of lighting. Alternatively, you could opt for some spotlights to be placed around the room, these will light up the venue with a hint of the wedding colour scheme. The use of paper lanterns lights are also very popular. A combination of white lanterns with your main wedding colour can work extremely well. Bunting provides a very inexpensive means of beautifully decorating your wedding venue. You can even make bunting yourself at home, and it can be easily placed from room to room. Keep the design or pattern of the bunting minimal though so as not to risk it looking tacky. Again, perhaps follow the colours of your wedding scheme. If it is a summer wedding, you could use bright colours such as whites and oranges or pinks. If it is a winter wedding, perhaps choose some vibrant red patterns. One major benefit to a wedding marquee venue is that you can choose the lining of the walls and ceiling. If you were to host your wedding in a hotel venue, you have no say over the wall or ceiling design. You can however have a full say in what the ceilings and walls of your marquee look like. If you are opting for uniquely designed linings, maybe you should cut back on bunting and other decorations as collectively it can prove to be a bit too much. It is quite a popular choice to use dainty, fold up chairs as seating. However, considering how long your guests may be sitting on those chairs, it is advised to hire some slightly more comfortable seating. Some proper chairs can also be decorated beautiful with sashes and chair covers. When designed properly, they really look the part and can add to the overall look and feel of the marquee. Unless your ceremony is also taking place in the marquee, there is no need to splash out on expensive flowers and trees to line the aisle. Instead, it is a good idea to have a centrepiece of flowers on each table and perhaps place a small arrangement of flowers at each entrance to the venue. You do not have to use huge displays of flowers, you should be using the flowers merely as a means to add colour to the venue. If you plan on hosting a party, you may find that a marquee can prove to be one of the most affordable options. Rather than hosting your special occasion in a local bar, restaurant or club, why not host it in your own back garden? It is certainly more affordable for guests as they can then bring their own beverages of choice and not have the pay the prices charged in licenced premises. You can prepare food in your home and easily transport it out to the marquee, undoubtedly allowing you to make savings on food too. It is separate from your actual home too, so you do not have to worry about your place getting messed up. If you do intend on hiring a marquee for a party, there a couple of tips that are worth considering. Although it may be bright throughout the day, the nights can turn cold and even wet at times. If you are holding an all day event, you need to ensure that your marquee can hold its own against any weather condition. Make sure that you have heaters installed in the marquee for night time and that the walls are removable to either let air in or keep in the heat when needs be. Keep some umbrellas by each entrance for your guests too. Don’t try to cut costs by going for the smallest marquee possible. When people are dancing and crowded inside, they can get quite hot and sweaty! You want to ensure that your guests have the space to move about easily, dance and thoroughly enjoy themselves. Be sure to ask your marquee hire company to advise on the most suitable size marquee for your intended number of guests, taking a DJ booth, bar or tables into account too. Assess how many power points you will need for lighting, heating and other equipment. Could you possibly run the supply out from your house? Do you need to hire a back up-supply? The last thing that you want is for your power to go during an event. A party without any light, heat or music would make for quite a dull affair! If you want to ensure that you can hire the appropriate marquee for your event, be sure to book it as much in advance as possible. Settling for a smaller marquee with less amenities will affect the quality of your event. Give yourself plenty of time to map out the exact space that you will need as well as any additional features, equipment or supplies that you may need. Otherwise, you could end up having quite a stressful time planning your party. If you are going to hold a large party on your property, there is always the chance that someone may get injured or that the marquee or equipment may suffer some damage. To save yourself a major headache, be sure to ask any marquee hire companies that you contact about their public liability insurance. Marquees are a very popular choice of “venue” for many events including weddings, parties, luncheons and more. They are very versatile, allowing you to host your event pretty much anywhere you like, no matter the weather. They can prove to be a more affordable option than hiring out a restaurant, bar or hotel function room too. If you are considering hiring a marquee, there are 5 questions which you need to put to the hiring company before committing yourself to a booking. 1. What size marquee would I need to cater for my event? The last thing you need is to hire a marquee and find that your guests feel cramped and squashed, and in turn end up spilling out onto your lawn. Equally, you don’t want to find yourself splashing out for a marquee that is far too big for the amount of guests you intend on inviting. Provide a marquee hire company with an idea of the number of guests you intend on hosting, along with details of catering, entertainment or amenities which may occupy space in the marquee. An experienced marquee hire company should be able to then recommend the most appropriate size marquee to suit your requirements. 2. What exactly is included in the package? You don’t want to agree for a price for marquee hire only to then discover that flooring, lighting, heating, covers and other necessary elements are charged additionally. Tell the marquee company exactly what you require, not only in terms of marquee size, but in terms of power, lighting, heating, toilet amenities, flooring, dance floor space, seating and other elements. You may decide that it is more cost effective to hire the whole lot together as a package or perhaps to arrange some facilities separately yourself. 3. Do you have appropriate insurance? You need to be clear before hiring a marquee where the liability lies should anything go wrong. 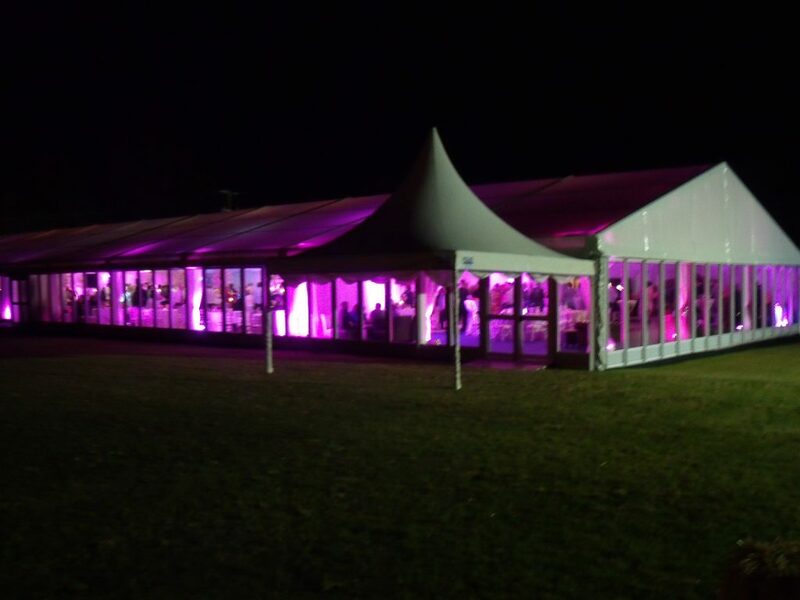 If anything should get damaged or if the marquee turns out to be faulty, you need to know that the marquee hire company is insured against such occurrences. 4. How long will I have the marquee for? Some marquee companies may provide and set-up your marquee a day or two in advance of your event as part of your package. Others may not allow for the marquee to be set-up until the day of the event itself. If you need the marquee for a little while the following day after an event, as is often the case with weddings, are they okay to wait two days before pick-up? You don’t want a marquee occupying your garden space for a week either so you must be sure before committing to hiring a marquee that you are fully aware of what date it will be set-up and what date it will be picked up again. This will be crucial to your planning of the event too. 5. Is my property suitable? 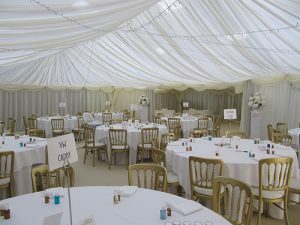 Before taking a deposit, a marquee hire company should inspect the site on which you intending on placing the marquee in. Issues such as uneven ground, unavailability of appropriate power sources and site dimensions can easily be identified from a site inspection. Such issues may require the purchase of additional extras so it is important that a site inspection takes place before any price is agreed or any money is handed over. Planning a party can be a daunting task, because you have to make sure that everything is in place and perfect on the day/night. Private parties can range from a small get together to a bigger once-in-a-lifetime celebration. Whatever the reason for your party, you most definitely will want it to be a success. Following these simple tips can be a big help when planning a private party. It is good to know in advance the amount of guests you will be inviting. The amount of guests gives you the starting point to getting a venue and buying adequate food. If you are considering sending invitations, try to send them as early as possible and it is a good idea to include an RSVP option, as this will help you to know who will be attending. So, you now know how many guests you have attending your party, now you have to search for the venue. Hosting your party at home, if you have few guests and the right amount of room, can be very convenient and cost effective. If you need to hire a venue, they require you to know the amount of people attending as they may have limitations on the number of people that they can cater for. You could consider an outdoor space for more privacy, if the weather allows. Marquee hire is a very popular and wise choice when hosting an outdoor party :). This can be anything from a buffet to a sit-down meal. The venue may offer you the food at an extra cost, depending on the place you have hired. Other venues may want you to purchase your own food from another source. If you are having your party at home, you could buy finger food and cook it yourself to save money. The important thing to remember is to provide enough food that will suit many people’s tastes and dietary requirements. Music or entertainment can be a great way to get everyone in the party mood. Many people choose a good DJ or a Band for a party. Entertainment can be anything from a magician, dancers, fire breathers, comedians to even clowns. These can be a popular choice for parties such as kids birthdays or weddings. Often a theme can be an imaginative way for everyone to get involved in the party. Popular themes include 70’s, Disney, Black and White, Hollywood Glamour, Movie Night, Superhero’s etc. When planning any party a budget is very important. Decide on how much you would like to spend and stick to it. A good thing to do is write down what you want to spend on each area and spend only that amount. Remember you can only do so much planning but after that it is out of your hands. Go to your party and just relax, enjoy the day/night and have fun with friends and family who are there. The above are only a few tips to planning your party, and following them will ensure that you’re well on your way to planning that perfect party. When all planning is complete you can look forward to having a brilliant time with all your friends and family! Corporate events are an integral part of business and serve to leave a positive and lasting impression of your company on both your existing and potential customers and clients. Every company wants their corporate event to be memorable, impressive and fun even – and they can be! You can enhance the image and reputation of your company by organising a professional and unforgettable corporate event. Planning a corporate event calls for different requirements depending on the time of year it’s held, the venue you choose and the food you would like to serve. A winter event will be organised differently to one that is planned for the long days of summer time. If you are responsible for organising and planning a corporate event this summer, follow these tips to ensure that your corporate event is the talk of the town for all the right reasons. Hiring a marquee can provide the ideal solution for a corporate event planned for the summer. 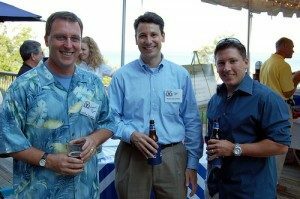 As everybody knows, heat and humidity or a deluge of rain can threaten to sabotage your event in the summertime. Therefore, a marquee can provide the comfort you require for your potential clients and customers while offering a large and comfortable environment and also providing shelter at the same time. Marquees come in all shapes and sizes from traditional marquees to more elaborate and secure types of marquees. There is something to suit all corporate events including covered walkways between smaller marquees and high quality toileting arrangements for your guests. Marquees can be decorated as you wish with a wide selection of furniture, accessories, linings and décor. Marquees are very user friendly with plenty of space in which to cater for all comforts including carpeting, ambient lighting, level and stable flooring and some are even climatically controllable. Whether you are coordinating an exhibition, conference, promotion or product launch for your guests, you can be sure that a marquee will address your needs perfectly. In summertime, you have several options with regard to the food you serve at your corporate events. Foods such as a wide selection finger foods, cold meats and salad buffets are all good choices. You can also consider a barbeque which is a firm favourite with many. During the summer, spirits are high and people are generally cheery and exuberant so you will need to provide entertainment to coincide with the mood, but be careful as you do not want it to detract from your event. A professional DJ or good quality band is always a great choice to keep the mood high and your guests entertained. While some would argue against a theme, there are many who believe that a thematically inspired corporate event is the most memorable and successful. For summertime, choose from themes such as a Garden Party theme, Country Summer Party theme, Beach inspired event or Summer Cocktail event. Alternatively, a theme organised around your company brand or product is also an effective way of leaving a lasting impression on your guests. Planning a wedding is no easy task. There are so many things that have to be organised; from hiring a venue and accommodation for your guests, deciding on a vehicle to drive you to and from the ceremony, right down to getting the best table decorations. If your wedding is to be held outside then you are going to need a marquee. Below is a list of five things to ask yourself when thinking about hiring a marquee for your wedding. Unless you are very wealthy you are probably going to have a budget for your wedding. Hiring a marquee can be very expensive so knowing how much you have to spend before you start researching them is going to save you a lot of time and heartache. Another thing to consider when budgeting for the marquee is what are you going to fill it with? You will want to take into account the cost of tables, chairs and decorations as well as the catering and bar services. Where is your wedding going to be held? When using a marquee for a wedding you are no longer restricted to village halls or stately homes – you can get creative with your venue, as all you need is a patch of land. Look around your local area and think about where you want to hold your perfect wedding. Parks, castle grounds and even farms could all be hired. Just make sure you think about access and parking as well as getting permission from the landowner. When do you need the marquee? You are going to want to know the date of your wedding (obviously). Marquee hire companies can become inundated with bookings during the summer months so you may need to make a decision on a marquee and book it well in advance of the wedding date. Don’t leave it until the last minute, look to book your marquee at least six months before the big day. What size of marquee do you need? This is going to go back to your budget and how big a marquee you can afford to get. More importantly, it needs to be big enough to hold all of your guests, tables, catering and bar equipment and maybe even a DJ or band and dance floor. You are going to want power inside your marquee. The catering and bar staff will need it for various things; it will be needed for lighting inside the tent and for the music too. 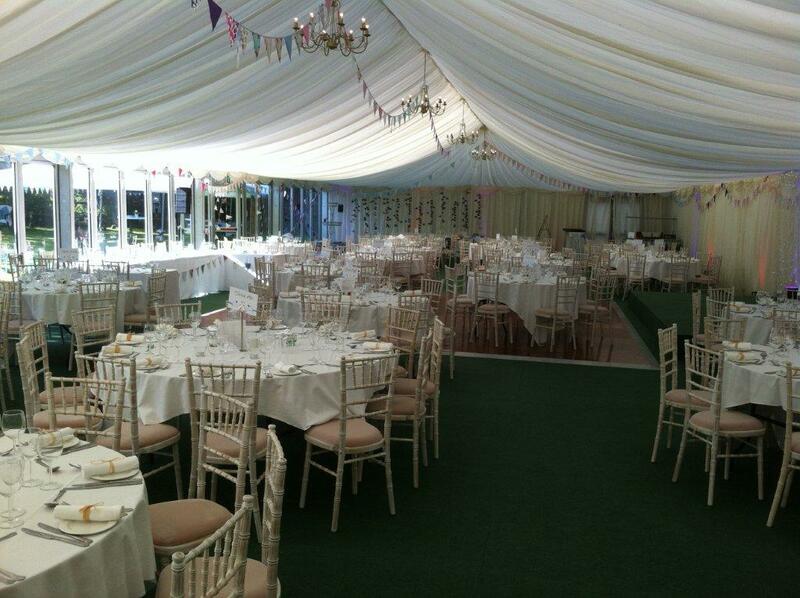 A marquee hire company will probably provide power at an additional cost but it is best to ask them and make sure. Everybody wants his/her wedding to be perfect and a marquee plays a huge part in making this possible. Getting the right style and size of marquee is so important when it comes to giving yourself and your guests the best wedding experience possible. Hopefully this list will help you, your family and your guests to have a very memorable and special day. Planning a party can be a daunting prospect, especially if you’re the unorganised type. Finding a suitable venue, organising the food and booking some fitting entertainment – there can seem like there is an endless list of tasks to get through before the big event. However true this may be for a regular party, this is especially the case when planning a party in an outdoor marquee. Follow our top 10 party planning tips for a successful outdoor marquee party to make the process a whole lot simpler! Planning any party takes a lot of hard work, but the best parties are the ones where a little effort has been made. Therefore, make sure to give yourself plenty of time to plan and organise your party to how you want it. Every good party has a theme that allows the organiser to get creative with other elements of the party including the invitations, décor, favours etc. Depending on the type of celebration, you can choose an appropriate theme that will tie all elements of the event together. You should consider the style of marquee that you will need to adequately and comfortably accommodate the number of guests you are expecting to attend. You can choose from simple, rectangular marquees to larger more ornate marquees with peaked ceilings. The party décor will set the mood and with an outdoor marquee, there are plenty of options with regard to how you decorate the available space. You can use candles, balloons, drapes and lots more to decorate the marquee and give it that party feel! With an outdoor marquee, you have to ensure that you have adequate toilet facilities for your guests. Whether you choose to use your own home toileting facilities or choose to hire a portaloo for the day, don’t forget this very important consideration! Ensure that you have adequate tables and seating in your marquee for your guests. You can pick from banqueting tables to round or square individual tables. An adequate number of chairs should be available to give your guests the opportunity to rest when they need to. Entertainment is key to any successful party and in an outdoor marquee; you will be able to accommodate either a band or a DJ. Either option will ensure that your guests are up and dancing the night away. The lighting at your party can go a long way to creating the right ambience. Whether you decide to opt for candlelight or disco balls, make sure the lighting reflects the overall mood of the party. Ensure that you choose high quality food and plenty of it as there is nothing more disastrous than running out of food at a party! An outdoor marquee affords you plenty of options when it comes to food in that you can have a sit down meal or a buffet-style spread. After all your hard work, remember to mingle and chat with your guests and enjoy the party that you’ve worked so hard on organising! A party in an outdoor marquee is a unique way to make any party memorable and unforgettable – for all the right reasons! As more and more people are now looking to other types of venues to hold events and celebrations, marquee parties are becoming a very popular option for many different reasons. Marquees are now being used to celebrate weddings, anniversary festivities and birthday parties as well as holding charity events and corporate functions. A marquee looks very impressive and is especially outstandingly striking when decorated appropriately and tastefully. As there are a multitude of options available to you, you’ll be spoiled for choice when it comes to choosing décor for your marquee. To give you some inspiration, we have put together our top 4 marquee party décor ideas! One of the best ways to create an ambience for your marquee event is to select the correct lighting. For an elegant or romantic feel, candlelight is a good option. Candelabras placed around the marquee as well as tea lights sitting in some attractive holders on tables will create a beautiful ambience. Uplighters placed strategically around the marquee also produce a wonderful visual effect while providing necessary lighting at the same time. If you are using drapes in your décor design, why not secure a black drape to the ceiling of the marquee and place strings of LED lights running across them to create a sort of ‘night sky’ effect? The resulting effect is quite magical! The use of drapes to decorate a marquee is a fantastic way to create a soft and beautiful effect. You can choose from any number of colours, however, if you have a theme in mind for your event, try to complement the colours of your drapes to that theme. For example, if you are having a black-tie event then black, white and silver drapes would best complement your theme. You can also choose marquee linings that are attached to the interior of the marquee to give it a very elegant and classy feel. These marquee linings can also be complemented with matching swags or bunting. Balloons can be tastefully arranged around your marquee to really give it that party feel. Helium balloon bouquets placed around the general area are a great way to decorate the space and again, remember to tie the colour of the balloons in with your overall theme or event type. Balloon columns and balloon arches are also other popular features of marquee party décor that look equally as impressive. Hanging some attractive decorations from the ceiling of your marquee is a great way to decorate that open space, especially if your marquee is quite big. An innovative way of creating a stunningly decorative effect is to hang coloured rice paper lanterns at varying heights around your marquee. Alternatively, for a similarly striking effect, you can hang large pompoms that are made from tissue paper, fabric or tulle from the ceiling. A tastefully decorated marquee will add that little extra wow-factor to your party. With a little bit of inspiration and creativity, you can transform a mundane and uninteresting-looking marquee into a wonderful space that both you and your guests can relax in and enjoy. It’s only when you begin to organise your wedding that you’ll realise the overwhelming amount of things that need to be looked after. Everything from the venue right down to the guest favours must be planned, arranged and organised by you. For that reason, one of the most useful things you can use when organising your wedding is a wedding planning checklist. This ultimate planning tool will ensure that you remember to address all the important elements of your big day to make sure that it is a wedding to remember! Here is our wedding day checklist with some of the most important items that will act as a starting point for your wedding planning journey. 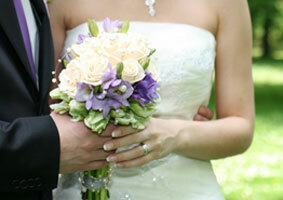 The most important element of your big day is the location where your wedding ceremony will be taking place. Whether you are opting for a church wedding or a civil wedding ceremony, you will need to make sure that the location is available for your chosen date. There are a number of legalities that also should be taken care of when you are planning your big day. There is an obligation to notify the appropriate authorities of your intention to marry, which must be completed within a specified period of time before your wedding day. You’ll soon realise that choosing your wedding dress is one of the most daunting yet most enjoyable aspects of getting married. The dress of your dreams may have to be ordered from abroad or handmade by your favourite dressmaker so make sure that you leave plenty of time for it to arrive and for any necessary alterations to be made. Similarly, your bridesmaids’ dresses and groomsmen’s suits may also require ordering and altering so they too should be chosen in plenty of time. While you may not think it, flowers will play a major part in the overall atmosphere of your big day. You will need to organise your bridal bouquet, bridesmaids’ bouquets, buttonholes, flower girls’ posies, floral arrangements for your venue and presentation bouquets. After all the flurry of your wedding day is over, you will want to have some photographic memories of the biggest day of your life. Booking a reliable and professional photographer is the best way to capture your special moments in time so that they can stay with you forever. Given that you must give your guests at least 6-8 weeks’ notice of your upcoming nuptials, you should make sure that you have designed or received your wedding invitations well in advance. As well as all of the above you’ll have to think about transport, videographers, hairstylists, makeup artists…the list goes on. With all that in mind and following the checklist that’s outlined above, you’ll give yourself the best chance at organising a day to remember – for all the right reasons. Happy planning!